My friend Charlie from The Runner Beans is running the New York City Marathon this weekend. Instead of completing her final training run before travelling to the US (she assured me she'd fit it in the next morning) Charlie and I set up a mini nail station, complete with tea and brownies, and got to work creating some go faster nails! 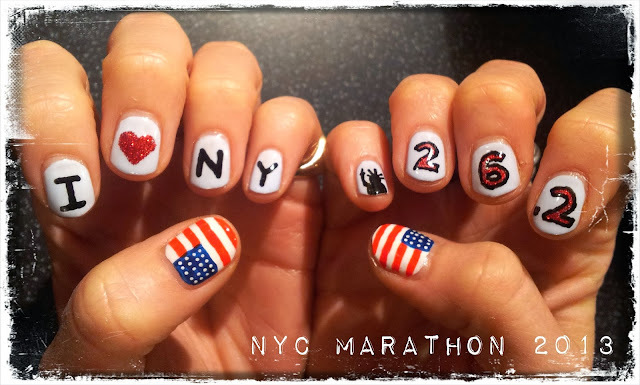 Charlie asked me to do her nails for the marathon a while ago, so I'd been keeping an eye out for good NYC nail inspo. She gave me three elements which she wanted to include, '26.2' (the distance! ), 'I heart NY' and an American flag, but the rest was up to me. I decided to stick to a red, white and blue colour scheme and included some glitter polish for a little extra sparkle. 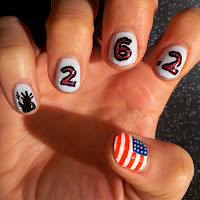 We put an American flag on each thumb, as these have the largest area. 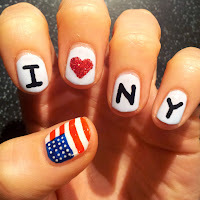 Instead of squeezing I heart NY onto one nail, we spread it out across four, which looked great. The base colour for the fingers is Models Own - Blueberry Muffin. It's nice and pale but not as stark as white. On the other hand I drew on 26.2 in Barry M Glitter Red, and a silhouette of the Statue of Liberty, although I seem to have added a few pounds to her, oops! For the detailing I used Barry M nail art pens and a small brush. We did a guest post on Charlie's blog, which you can see here.